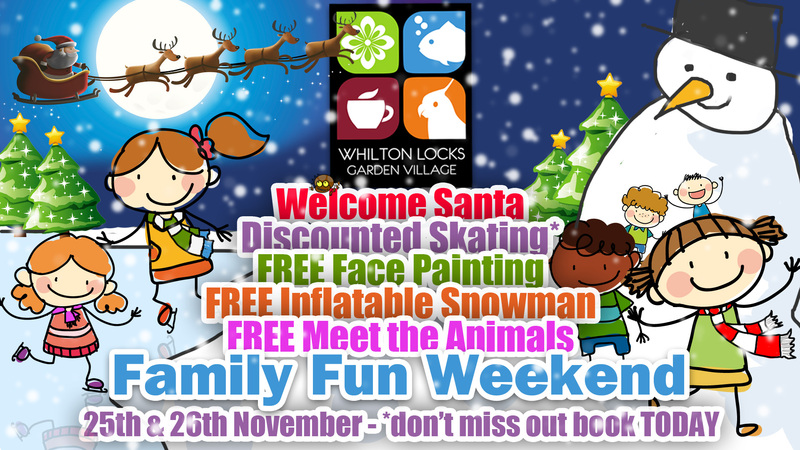 What could be better than a fun day at Whilton Locks Winter Wonderland to really get those festive feelings? This weekend we welcome Santa to his bigger, better and more beautiful Grotto (we are just adding the finishing touches and I have to say – as I was let out, away from this keyboard for a moment, it is looking incredible; the best yet) and we’d like to invite you to join in the fun with a host of free and discounted activities throughout the store. FREE facepainting, FREE meet the animals and FREE Frosty our huge inflatable bouncy snowman – all day, both days. Welcome Santa to his Grotto (which first opens this weekend) and enjoy discounted Ice Skating all weekend (Online ice skating booking is recommended). Skate – at an incredible discounted rate. It’s Icy, on Twicey and you can Save on the Pricey! It’s the cheapest skating price in Northamptonshire and this weekend sees the cheapest weekend price at WLGV. It’s the best deal for smiles! Please Note: Discounted Skating is available all weekend and spaces are selling out quick – so book today! ← Ice Rink is now OPEN!